Repsol has made two new hydrocarbon discoveries in the Karabashsky 1 and 2 blocks in Western Siberia in Russia. According to the Ministry of Natural Resources and Environment of the Russian Federation’s calculations, these finds could add 240 million barrels of oil equivalent in recoverable resources for Repsol. According to the Ministry of Natural Resources and Environment of the Russian Federation this is the largest discovery made in Russia in the last two years. The Gabi-1 and Gabi-3 wells have been drilled with the use by Repsol of innovative drilling and seismic techniques that will allow the potential of these resources to be fulfilled. The company`s exploratory success in Russia, the world’s second-largest crude producer, adds to those obtained during the last year in The United States, Latin America and Africa. The company has for the last three years beaten its own resource addition targets outlined in its 2012-2016 strategic plan. Repsol has made two new discoveries in the Russia’s Karabashsky blocks, in the West-Siberian Ouriyinskoye field. The recoverable resources from the Gabi-1 and Gabi-3 wells are estimated by the Ministry of Natural Resources and Environment of the Russian Federation at 240 million barrels of oil equivalent, a considerable addition to the resources Repsol currently holds in Russia. The Minister of Natural Resources and Environment of the Russian Federation, Sergei Donskoi said this find is the biggest made in Russia in the last two years. 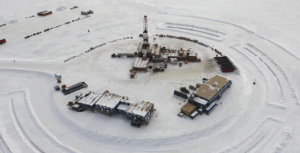 The use of modern seismic techniques to detect these potential resources has allowed Repsol to make these significant finds in a relatively unexplored area of West Siberia. The discoveries confirm Repsol’s expectations of its Russian operations, where it is developing one of its key strategic projects, the AROG joint venture, together with Alliance Oil. The exploratory success obtained in Russia adds to the successes during the last year in the United States, Latin America and Africa which added resources that will boost reserves over the coming years as they are developed. In 2013, Repsol posted the highest reserve replacement rate amongst its peers at 275%, which also beat the company’s own reserve addition targets for a third consecutive year to reach a total 1.515 billion barrels of oil equivalent. Repsol has boosted its exploratory activity in the last few years with significant success, with more than 50 discoveries since 2008, including some of the world’s largest finds in the period. Repsol has been exploring the Karabashsky 1 and 2 blocks since 2010. In 2011 it created a joint venture with Alliance Oil, called AROG, which is a growth platform for both companies in Russia, combining the knowledge and access to exploration and production opportunities of Alliance Oil in the country with the experience and technological capacity of Repsol, including new drilling techniques. During 2013, Russia contributed 14,600 barrels of oil equivalent a day to Repsol’s production. This has risen to 17,640 boepd in 2014 with the startup of new gas wells on the SK field.